Dalmatian is a dog that is quite unique,they have a pure white Kilt covered with black spots. No other pure breeds in the world that has the type and ferias white with black leopard combinations. No one really knows where Dalmatian originated but according to some sources while the Dalmatian originated from an area called Dog Dalmatian has been found in Italy, there is even a famous poet named Jurij Dalmatian mention of this dog race in one of his works. But all convinced that the origin of Raps Dalmatian originated from Europe and Africa. Dalmatian has functioned for many things over the years, in Dalmatia and Croatia he used to protect the border; these dogs have also been used as hunting dogs for hunting instincts are very good. Often the Dalmatian is also used as circus dogs. In America Dalmatian known as firefighters, they duty is to protect the fire engines. Additionally Dalmatian used to dispel crowds and usually also participate along with firefighters go in and rescue people trapped in a burning building. Dalmatian dog must have a beautiful slender body and has the speed and endurance, other than that they have good muscle that used to run and fight. Dalmatian dog breeds are very active dogs that need lots of practice, and also a good diet and healthy, they'll escape and adventure on their own for several days. You need to consider the character of Dalmatian dogs is easy to remember every command and rapid trauma with a variety of conditions that are not fun for them. 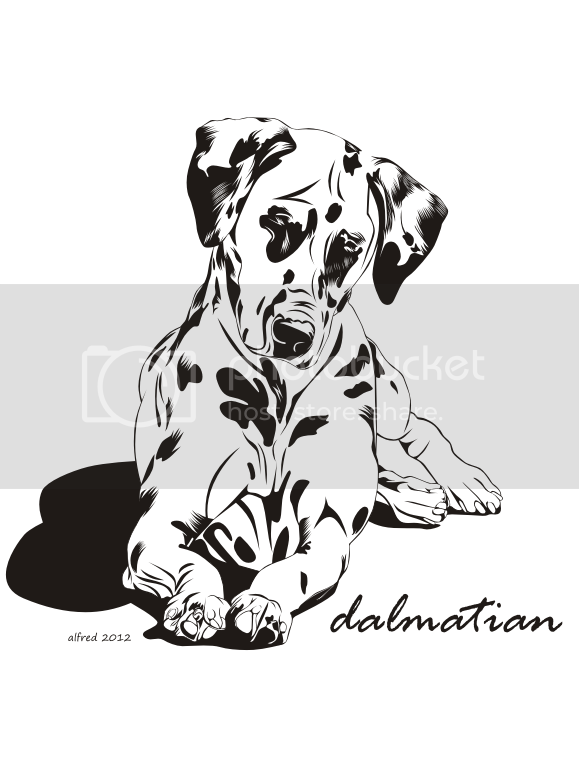 because in terms of Dalmatian dog look very attractive, therefore I make a picture vector in the form of vector line art that can be applied to all print media such as vector images into T-shirts with screen printing and other ways. I've provided free of charge for your vector file in CDR format (for users of Corel Draw) and PDF format files for users of other applications.